Civilization V is a game of endless possibilities. With random maps, many civilizations and the ability to tailor your civilization's abilities, you can play for hours. Still, there is room for addition and one of the major additions is the ability to play more civilizations. 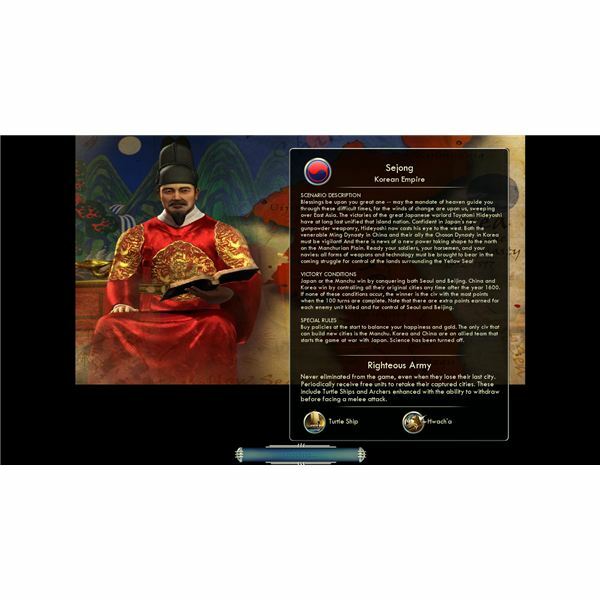 That is where the downloadable content comes into play, and it is hardly surprising that the first of the new civilizations added to Civilization V are the Koreans. Not only do they have a long and interesting history, but they play a lot of video games. Still, while this is certainly at least a nod to a customer base that the makers of Civilization would like to expand, it is also an interesting expansion with two additions to the game. The primary addition to Civilization V in this downloadable content is the Korean civilization. Like all civilizations in this game, they get two unique units and a unique trait. In the case of Korea they get significant bonuses to science. This comes with a +2 bonus to science for each specialist. In addition if you build a great person landmark you’ll get a +2 science bonus for working it. Finally, you get a science bonus every time you build a science building in your capital. All of this sounds like it should have a huge advantage, but the truth is that it, like most of the abilities, is more minor than it seems. At the beginning of the game when +2 science is important you don’t have the ability to use specialists. This means that the first real bonus you’re likely to see from this is building a library. Where this ability really helps is that it allows you to focus more on special people as well as science. By the end of the game you should be ahead perhaps one or two technologies of where you would be without this ability. This means that if you have focused on science you should be near or at the top. At least as big an impact are their special units. The less impressive of the two is the turtle ship. This replaces the Caravel but is considerably more difficult to destroy. This can help you control the oceans and the ranged attack can help a lot with capturing enemy cities. Still, in many games in which you are not by significant amounts of water, this will not come into play. More likely to be useful is the Hwach’a. This appears in the mid game and replaces the trebucheh. The difference is that it is considerable more powerful against enemy troops, but doesn’t do as much damage against cities. This means that they do very well defensively and gaining the upper hand in the war, but slow down once you are winning. This isn’t a huge difference in power, but it has a large effect when you’re playing as or against Korea. In addition to having a new civilization, the downloadable content also includes a new scenario. This scenario takes place during the Samurai invasion of Korea. This is a hundred turn scenario in which you cannot gain technology, but get a significant amount of points towards policies. The object for Japan or Manchu is to control both Seoul and Beijing while Korea simply has to control their original cities. This is effectively a war Scenario, but one that requires a lot of strategy and not simply brute force. This is because in order to achieve any of these goals in 100 years you really need to understand your strengths and the enemy's weaknesses. It is also likely that even skilled players are going to fail this the first time. With four civilizations where each play very different, there are a lot of hours of enjoyment to be had in this scenario. Still, this isn't really all that much more impressive than some of the free mods that are available in the game. The Korea download pack costs 4.99. This feels like a lot for a single civilization and single scenario. Still, if you ignore what has come before and look at the value you're going to get from this based on the cost it is far better. For five dollars you have hours of gameplay in the scenario as well as a permanent upgrade to the game in the form of a new civilization. So, if you don't mind buying the new content of this game piecemeal, this isn't actually a bad deal. If you are looking for downloadable content that is going to dramatically change the gameplay of Civilization V, fix major problems or rekindle your interest in the game, this expansion pack isn’t likely to do that. Still, if you are already enjoying Civilization V and simply looking for a new twist on the same experience then five dollars really isn’t a bad deal. This makes it a solid three star pack which will be good for those who already love the game, but won’t do much for anyone else. A look at what is new in Civilization V.
Civilization IV vs. Civilization V: What’s New?